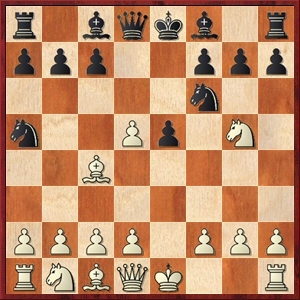 Two Knights Defence 4.Ng5 main line - Chess Gambits- Harking back to the 19th century! The main line is of sufficient importance to warrant its own separate page. With 5...Na5, Black counterattacks against the bishop on c4. The main downside of this continuation is that Black's knight can end up largely shut out of play on a5, but the upside is that Black can usually accumulate a large lead in development by kicking the g5-knight away with ...h7-h6, and playing active developing moves. Black will then try to force concessions from White through active piece play, and in some lines can consider launching a kingside pawn storm during the middlegame. However, White can generally maintain the extra pawn, which leaves the chances dynamically equal in most cases. White can consider 6.d3, defending the bishop on c4, but this doesn't offer White much after 6...h6 7.Nf3 e4. I have chosen an illustrative game featuring David Bronstein's interesting piece sacrifice 8.dxe4 Nxc4, securing two pawns and a strong mass of central pawns, which may be White's best practical chance following the inferior 6.d3, but it should not really provide enough compensation. Instead the usual continuation is 6.Bb5+ c6 7.dxc6 bxc6, whereupon White can pin Black's c6-pawn with 8.Qf3, but Black has three strong responses in 8...Rb8, 8...Be7 and 8...h6. 8.Bd3!? 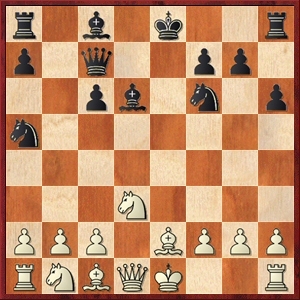 has been tried at grandmaster level in recent years, with the idea of playing c3 and Bc2 (then Mark Ginsburg's recommendation 8...Ng4 is a strong reply), but the main line is 8.Be2 h6 and then White chooses between 9.Nh3 (after which Black should generally avoid the temptation to play ...Bxh3, as White can shore up the kingside using the light-squared bishop, and should instead play around the knight) and 9.Nf3. The traditional main line then continues 9...e4 10.Ne5 Bd6 11.d4 exd3 12.Nxd3 Qc7. Black is a long way ahead in development, and White's kingside lacks defenders for the time being, but White retains the extra pawn. White has a challenging plan starting with 13.b3, intending Bb2 putting pressure on Black's kingside, and I am not convinced that Black can get full compensation for the pawn against this. However, Black has the refinement 10...Bc5, encouraging 11.c3 (threatening a pawn fork with b2-b4) and then playing 11...Bd6, with the idea that White's extra tempo with c2-c3 makes it difficult for White to carry out the plan with b3 and Bb2. I get the impression that Black is able to get full compensation for the pawn without much difficulty. Instead of 6...c6, Black can also try 6...Bd7, which leaves White with a relatively devalued pawn plus (doubled pawns on d2 and d5) and in the long run White can find it difficult to hold onto the extra pawn on d5, but the downside for Black is that White tends to get a larger share of the piece play in that variation and White may have greater chances of a theoretical edge.